It’s difficult to go off a plain coloured shirt. You might knacker it. Or out grow of it. But stylistically, plain shirts tend to deliver strong value per wear. The same is not always true of patterned shirts. One minute they’re a pleasing novelty, the next they’re disrespected and balled on the floor. Once the pattern feels too familiar, once it loses its punch, they become a irritation. Good for no occasion. Even a careful ironing won’t resuscitate such a piece, you’d need a full mind transplant. Yet even in the face of this preamble, I’m feeling pattern. 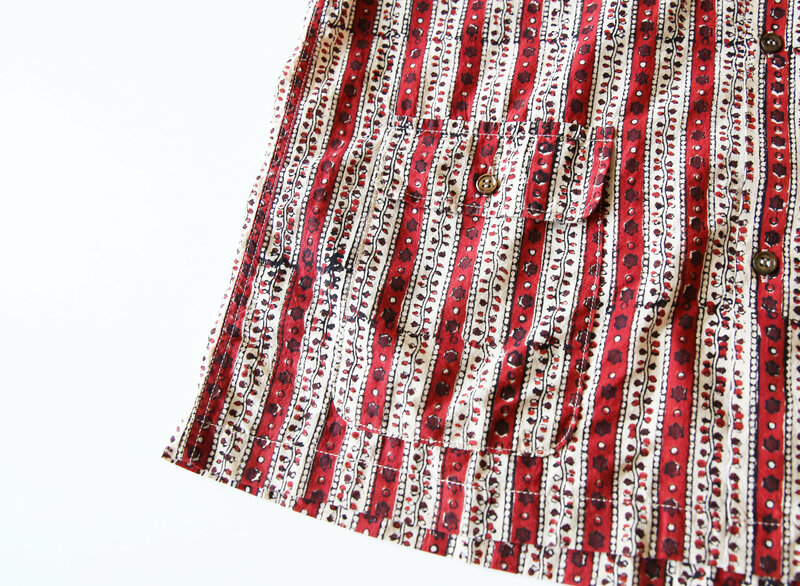 Years of plain navy, acres of olive green and finally I’m here, looking at patterned stuff and thinking, maybe…? It might be the weather. It might be the dogged smooshing together of prints over at thought-leaders Needles. It might be that I’ve finally gone full Colonel Kurtz. But patterned shirts are starting to make sense. 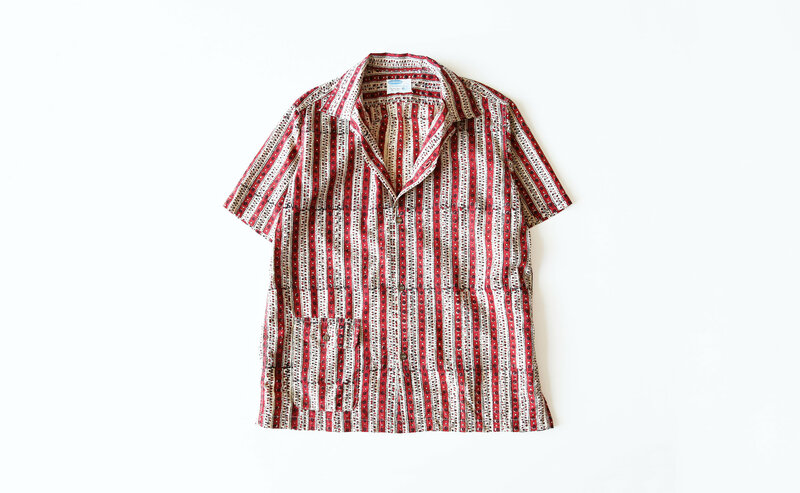 This piece, from Japanese brand Workers, is a decent introduction to decorated shirtwear. 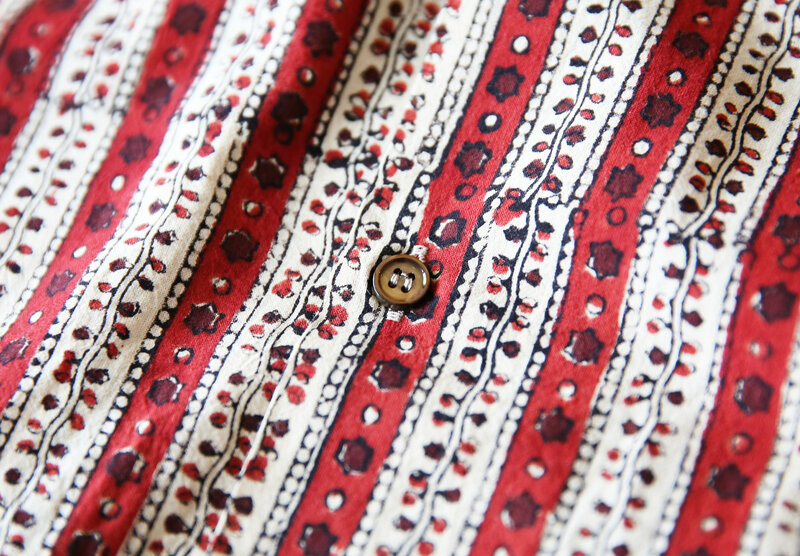 There’s a lightweight Indian block print cotton fabric at play, shell buttons and a pleasing patch pocket at the hip. It is this pocket, and of course the straight cut hem, that demands the piece is worn untucked. It’s casual, but with a undercurrent of formality – like a mob boss at Centre Parcs. I’d probably toss this over a plain long-sleeved tee. I do tend to think that short-sleeved shirts on their own can look a bit dad. Especially patterned ones. Jon Favreau in Couples Retreat is not the goal here. The long-sleeved tee offers a foundation, leaving the top layer to be a loosely buttoned as you wish. That’s my key tip for high summer. Yes, I’m suggesting a double layer of cotton. You will look cool. Even as you broil from the inside out.